It’s undeniable. Video is dominating content marketing and social media, but to get the return you’re looking for, you’ll need more than a one-hit-wonder in 2016. Marketers who have found the way to regularly publish video are experiencing huge results. Here’s why. We all know there’s a battle going on for great content. We’re all competing for an audience, to be seen and heard, to be liked and trusted. Publishing great video on a consistent basis will put you far above the competition– enhancing your content mix and brand building value for your current and potential customers. Just look how the major social sites have turned to video to attract audiences and encourage video sharing. Additionally, while reports repeatedly prove people love to watch video and the positive effects video can have on human action taking, you can greatly improve your presence on search engines with multiple videos each optimized for unique results. 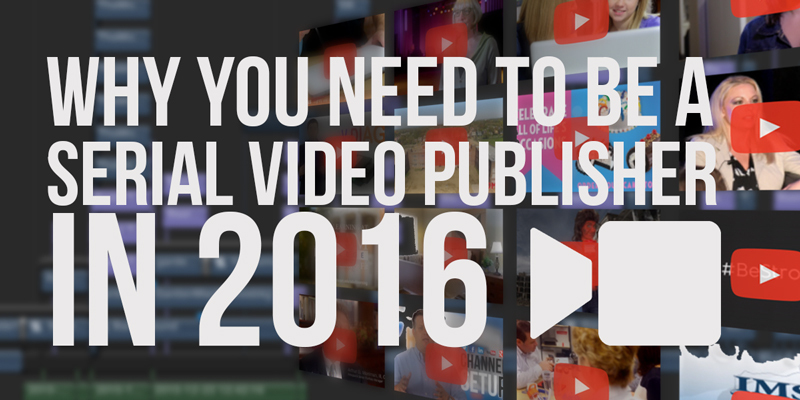 The bottom line is you will need to be a serial video producer in 2016 and beyond for your business. Being a serial video producer doesn’t mean you have to publish video every day. You may need as few as one video a month– but don’t let us discourage you from delivering a bi-monthly video or weekly series! The more time and resources you and your marketing team are able to put into strategy development and ideation for your videos, the better the results you should expect. But don’t overcomplicate it to the point that it prevents production. So what should your videos be about? Once you get started practicing brainstorming ideas for video you’ll discover more ideas you need. First, consider videos with messages and calls-to-action that align with and complement your current goals and strategies. How about short teaser videos that drive traffic to website or blog posts? Other easy-to-implement ideas include answering your customers’ frequently asked questions or you can give unique tips that separate you from your competition. Don’t forget about video taping presentations and extracting portions to create a mini-series. Certainly if you have the capabilities, you can go all out D.I.Y. However, you should agree with us that having professional high-quality videos that best represents you or your business is critical. Fortunately, with today’s technologies, many production companies now offer high-quality and low-cost production services, giving you the choice to hire out all or just a part of the project. At New Image Media, Inc. we’re all about helping any size business achieve greater levels of success with video. Contact us to discuss how we can help. If you found this post helpful, be sure to follow on Twitter, “Like” on Facebook and Follow on LinkedIn.